Internal perspective of the Zone designed by 2013 summer architect student, Emily Wright. Click to enlarge. The Fair Trade Zone is the name we've coined for an eco-friendly, campus-style production facility that we've started the plans to build in Ghana. 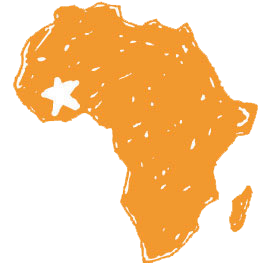 The vision of the Fair Trade Zone is to revive the Ghanaian textile industry by employing 200 women full-time in a comfortable, beautiful production center that cultivates an atmosphere of learning, healthy living, and team work. Though this will be primarily a manufacturing facility, Global Mamas will ensure that it does not feel like a typical garment factory. The production space will be open, comfortable, and filled with natural light. Landscaping will create natural outdoor spaces for batik production, fabric drying, and for the women to gather, eat, and rejuvenate during the work day. An onsite daycare center will foster a comfortable working environment for mothers to provide an income while not being far from their children. Office space for managers, meeting rooms, an outdoor eating area, and volunteer housing will complete the campus-style development. Remaining sensitive to its environmental footprint, Global Mamas plans to incorporate local, sustainable building materials like recycled plastic and tires, compressed earth blocks, coconut husks, raffia, and bamboo, in addition to renewable energy and water sources. A team of architecture students is researching innovative systems, such as rainwater harvesting, gray water recycling, solar and wind energy production, and bio-gas toilets to minimize environmental impact, while simultaneously providing access to a reliable supply of water and energy, which are often in short supply in Ghana. 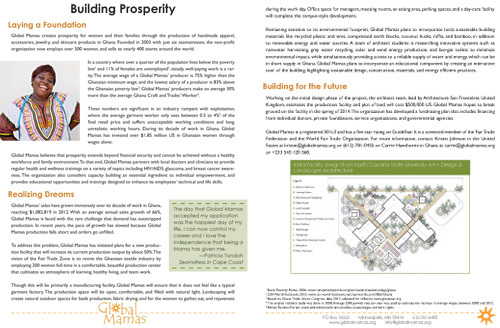 Global Mamas plans to incorporate an educational component by creating an interactive tour of the building, highlighting sustainable design, construction, materials, and energy efficient practices.